The 9th edition of the MuscleTech Network, the congress organised by FC Barcelona in conjunction with the Fundació Leitat, opened this morning as part of the XXVI International Conference on Sports Rehabilitation and Traumatology, which is being held this weekend at the Camp Nou. The MuscleTech Network is a workshop that brings together the leading specialists in the field of sports medicine to discuss muscle and tendon injuries. The 8th edition took place last October and another is now being held as part of the most important medical congress in the world. 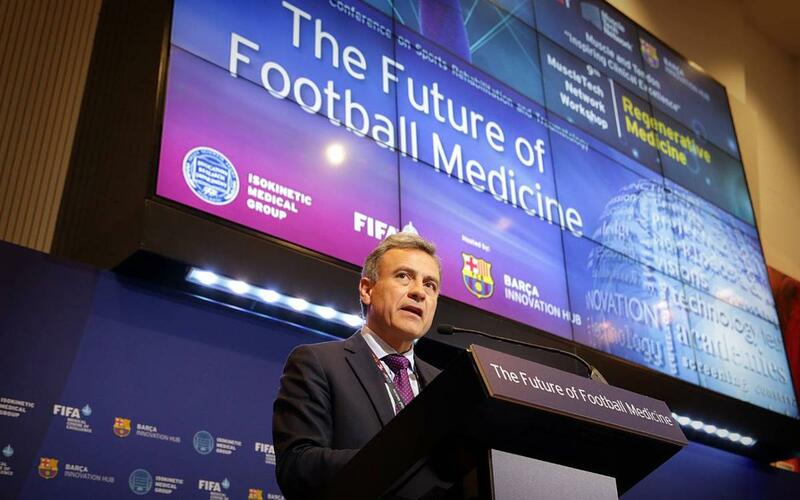 The edition being held today and tomorrow in the Auditori 1899 was opened by Dr Gil Rodas, director of the medical area of Barça Innovation Hub, and is focused on regenerative medicine. Previous editions have focused on such issues as quadriceps and hamstring injuries, as well as the transfer of the results of clinical research to medical practice. The MuscleTech Network is the platform whereby the very latest research results in the field are disseminated, debated and presented to the public. The initiative came about through the FC Barcelona medical area, which now structures the event via its Barça Innovation Hub, and the Leitat Technology Centre, which runs the activity via the Fundació Leitat. The aim is to create a knowledge and research network to focus on the prevention, diagnosis and treatment of muscle and tendon injuries, which are the most common type to affect footballers. The outcome being sought from this is better application of research results and findings to prevention and recovery from muscle and tendon injuries. In recent years, MuscleTech has conducted more than 30 research projects and published several articles in world leading scientific journals. “We have inaugurated the ninth edition of the MuscleTech Network, which has become a world leading forum for debating injuries affecting muscles and tendons, ligaments and cartilage, which are the most common in football. This meeting will be discussing regenerative medicine, mainly dealing with new biological treatments, such as platelet-rich plasma and stem cells for the treatment of football injuries. This afternoon and tomorrow, we shall be presenting a variety of clinical experiences and recent scientific studies and shall be debating whether these treatments are effective for reducing recovery times from injuries and limiting recurrence”. “The 9th MuscleTech Network workshop is a consolidated research platform in the field of muscle and tendon injuries involving national and international partnerships and projects. We gather the best scientists in the world to deal with future projects and ensure that the proper dissemination of the results delivers impacts and benefits to all society. The future of the research that we do at MuscleTech involves the consolidation of multidisciplinary collaborations and the transfer of such technologies as robotics and 3D printing to medical and sporting applications. This year we are also preparing for the 10th workshop, an important milestone for the platform”. In parallel to the MuscleTech Network, the XXVI International Conference on Sports Rehabilitation and Traumatology has continued with its programme of conferences in different venues at the Camp Nou. This morning, FIFA held its annual meeting with its Medical Centres of Excellence, one of which is FC Barcelona. The chairman of the FIFA Medical Committee, Michel D’Hooghe from Belgium, presented his report on the changes at FIFA and explained the governing body of world football’s key objectives in terms of medicine. Meanwhile, the activities of the medical congress organised by the Isokinetic Medical Group and FC Barcelona included a Toshiba workshop consisting of a round table moderated by Dr Gil Rodas on the importance of imaging in the future world of sports medicine and how it can help with the diagnosis of injuries.